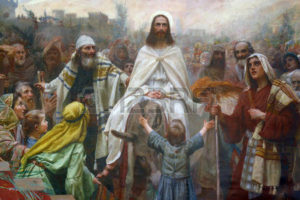 A sermon preached at All Saints Church, San Francisco, on Palm Sunday, April 14, 2019, by Christopher L. Webber. A week ago Friday I went to a demonstration. They held it at the corner of Powell and Market at 5 pm. There were placards being waved and a speaker, three speakers, in fact, holding forth. And a crowd. Not a very big crowd – maybe a few hundred quite a few waving posters of one sort and another. 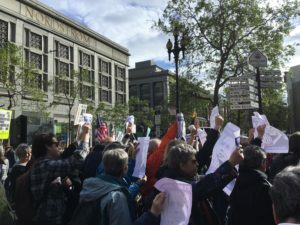 We were there demanding release of the Mueller report. I don’t think we made a difference. I didn’t see anyone with a TV camera and I don’t think it even made the local paper, but it made some of us feel better. Now, I wouldn’t have done that before I retired because I wouldn’t have wanted the parish I was serving to be divided by a political issue. But I’m not in charge any more and I do have opinions and I sometimes feel free to express them in public. But I’m as concerned as I ever was about political differences dividing the church and I would hope that maybe next Sunday Beth would mention in a sermon that she’d been at a Trump rally and we could celebrate the fact that our unity in Christ was greater than any divisions between Donald Trump and Robert Mueller or any conceivable divisions that might come between us. I think we could do that. I hope we could. If our unity in Christ isn’t deeper than our political divisions, there’s something wrong. I think there was a time when that wasn’t true. We assumed everyone else either thought as we did or else was wrong. The history of humanity is largely a history of wars being fought between armies dedicated to the simple proposition that we were right and they were wrong. We understand a little better now that not all minds work the same way and that we can sometimes learn from the way other minds work or at least need to be aware of their differences. I think, in fact, that human beings have always been fascinated by other lives, other mind-sets, other ways of thinking. We read books, or go to the movies, or exchange gossip to get insights into other lives. “Did you hear what happened to Joe or Susan?” we ask.“Can you imagine?”, we ask. And if we can imagine, really imagine, not critically, but sympathetically, (the word sympathy means “feeling with”) – if we can do that, if we can feel with others, we can grow, we can get outside ourselves a bit, not be so cooped up inside our own mind-sets, our own limited insights, the narrowness of our own experience and understanding. We need to pray for our leaders, on both sides – or many sides – that they have some glimmer of understanding of what it must be like to be Donald Trump, in an overwhelming job, under constant pressure, constant second guessing by talking heads, and with a very real possibility that his taxes will be made public and he may lose everything. Sympathy. Feeling with. Understanding. The need for understanding. To get inside the minds of others and see the world as others see it and understand, really understand, why they act as they do. Is it even possible. Do even husbands and wives, children and parents, ever really understand each other; really understand? But however hard that may be, think about the challenge posed by this morning’s epistle: “Let the same mind be in you that was in Christ Jesus.” Can you even begin to imagine really doing that? And yet, isn’t that just one way of saying what Christianity is all about and what we are doing here today? The letters of Paul come back to this theme again and again in all kinds of different ways. He talks about being “in Christ,” “Having the mind of Christ,” about Christ being in us, about being Christ’s body, about being joined with Christ. There’s a new jargon phrase I hear all the time in church talk these days: Christian formation. Well, yes: being formed – being re-formed – being not so much who we were as who we might be. “Putting off” – Paul’s language again -“putting off the old man or woman” and “putting on Christ”and beginning to be someone else: Christ in us; a new creation. What would it be like to look at Donald Trump through the mind of Christ, to think about it from Jesus’ perspective? But more important still, what would it be like to live even a minute or two or three of our lives here, with the mind of Christ? What would it mean to deal with the children, the grandchildren, the parents, the neighbor next door, the clerk in the store, the waiter in the restaurant, to say nothing of our political leadership with the mind of Christ. Could we, for a minute or two imagine, letting that mind be in us? The sentence just before that in Paul’s letter goes even further; it says:“Let each of you look not to your own interests, but to the interests of others.”Isn’t that dangerous doctrine? To look to the interests of others: Mexican refugees on the border, for example. They do me no harm, they don’t show up in my neighborhood. But some people obviously do feel threatened. Can I understand their interests? Can I look to their interests also or expect my representative to do so? And how do we deal with it when the President looks to other interests, that radical right, that so-called “evangelical” right. What is it that forms their mind-set, and could I somehow begin at least to try to understand, or share their concerns, or find common ground. What would a world be like where we all looked first of all not for our own good, but for common ground, common ground? 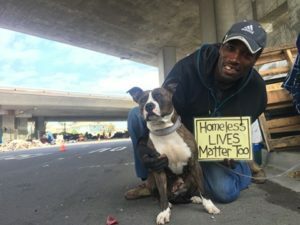 or better still for the mind of Christ: Christ in my spouse, my friend, my neighbor: Christ in the stranger on the N-Judah, the waiter in the fast food restaurant, the homeless man or woman huddled against our office buildings against the cold and the rain? It might not be easy. Having the mind of Christ led Jesus to the cross. Someone described for me some time ago an icon, a painting, showing Jesus at the moment of his arrest with soldiers bearing down on him with spears and clubs all pointing towards him and Jesus paying absolutely no attention but reaching down toward the slave whose ear Peter had just cut off, reaching down to heal, concerned for the other, not for himself. Death staring him in the face, and his mind, his hand, on the other. Have that mind in you, Paul says. Have that mind in you, that concern for the other before yourself. This church is here for that purpose. Here at the center of this community is a building and a gathering centered on the notion that others come first, and that we can make a difference in this world, can serve God best, can serve our neighbors best, can serve our families best, by letting the mind of Christ be in us. Paul goes on – we read it just now – to talk about Jesus emptying himself, humbling himself, down from the heights of heaven, down from any human glory, down to the place of a slave, down even to death and the grave. And what did it accomplish? Now, two millennia later, a worldwide church, a changed society, one in which elections are fought – sometimes at least – over how best to improve our schools, how best to provide security for older citizens, how best to use our government to heal and help and serve. And yes, that’s putting the best possible spin on a situation that we know falls far short of the mind of Christ, but think of how far we’ve come from the day we read about in the gospel when an innocent man could be arrested, tortured, and killed in a matter of hours, with no pretense of a fair trial. And think of how far we still have to go and yet what a privilege we have in being called to be citizens of the new kingdom Christ came to build and to come to his table and be nourished with his life and to let the mind of Christ so transform us that we see the world through his eyes and respond to it with his love. A Sermon preached at the Church of the Incarnation, San Franciisco, on March 31, 2019, by Christopher L. Webber. There is a wonderful, old English custom called “Mothering Sunday.” It started In the Middle Ages when boys were often sent out at a very young age to learn a trade as an apprentice. It wasn’t an easy life but once a year they were given a weekend off to go home and see their parents and the weekend on which this happened was the one on which the Sunday epistle spoke about “Jerusalem above” who is our mother. It was the original Mother’s Day; long before Hallmark cards were ever invented, and it gave the whole concept of motherhood a deeper and theological meaning. Motherhood is not just cards and flowers and apple pie; it connects with a deep imagery about ourselves and our eternal destiny. So here we are celebrating the day when the apprentices came home to mother and now the assigned readings gives us as a gospel with the story of the Prodigal Son who is welcomed home by his father. Where was the women’s movement when they did that? And yet, when you stop to think about it, isn’t it curious? Suppose I were to tell you a story about a young man who took the inheritance and went off to Washington and wasted his money on wine, women, and song and then came home seeking forgiveness. Now, who would you expect would be willing to forgive and forget, welcome him back and cook up a huge feast with his favorite recipes? Who would do that: his mother or his father? Which would you expect? And yet the gospel story never mentions his mother; it’s the father who is filled with compassion and runs to meet him and prepare a feast. The word for compassion is a very simple and obvious one in Hebrew: it is simply the plural form of the word for womb. The womb, the place of protection and growth and life is the obvious image of compassion. As the heart symbolizes courage and the head is wisdom, so the womb is compassion, and you might say that makes it a feminine virtue. Logically, we might expect the Prodigal Son’s mother to be the one to show compassion. But look deeper still. Go back to that critical moment when Moses stood before God on Mount Sinai and asked for God to be revealed and God proclaimed: “The Lord, the Lord, a God compassionate and gracious . . .” (Exodus 34:6) God is known first of all as a God of compassion of which the womb is the symbol. Then look at the last chapter of Isaiah and you will find a God who nurses Israel at the breast and dandles Israel on her lap and comforts Israel as a mother comforts a child. That’s not a passage we often read, but that, too, is part of the biblical picture of who God is. We are learning a lot these days about what it means to be masculine or feminine. Oddly enough, at the very time when we are moving toward gender equality in the work place, in opportunity in every aspect of society, at this very same time researchers are finding (there are frequent articles in magazines and newspapers) that the male and female brain operate differently, that men and women respond in different ways in areas as different as the emotions on the one hand and solving mathematical problems on the other. Equal, yes, but different all the same and only now are we beginning to understand how different and why. And as a result, maybe – just maybe – we will begin to get a handle on the typically male pattern of aggressive behavior and learn better ways to channel it, and maybe – just maybe – we will allow men to show emotions more openly, yes, and maybe to be compassionate: more like the Biblical idea of God. Have you ever noticed how often in the Old Testament the father figure is remote and uninvolved with his children? The story of Abraham and Isaac is a case in point: the father was even prepared to offer his son as a sacrifice. Or take the story of David and Absalom: David was the indulgent father, unable to say “no” to a son who finally saw no way get his father’s attention except by open rebellion. Again and again, we see fathers more concerned with their own goals and ambitions than with showing compassion, getting involved, saying, “I care.” It’s no wonder the image of God as Father never occurred to anyone until Jesus put it at the center of his teaching. It’s no wonder it still gives us a lot of trouble. What image of God does a child have whose parents are divorced and whose father is a weekend visitor, compensating for absence by indulgence, married, perhaps, to someone else who has no interest in the child? Worse yet, how many children today grow up in one parent homes and maybe never know who their father is. Even in the so-called traditional home what image is provided when the child misbehaves and the mother says, “Wait til your father gets home”? The father becomes the avenger, the disciplinarian, the judge. How will children think of God when these are the images provided to them of fatherhood? What will the Lord’s Prayer mean to them? I think we need to notice that Jesus never said “God is like your father.” He said that fatherhood can reveal God. But it’s a dangerous metaphor. It can destroy our faith. Worse still, it can destroy your child’s faith. But it can also hold up for us a vision of what fatherhood can be. It can give us an image of the potential in that relationship. And it can give the human father a role model better than those the television screen or the movies ever provide. This is what God is like. This is what true fatherhood can be. 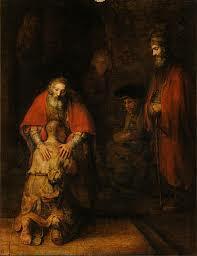 So Jesus told this story, but why do we call it “The Prodigal Son”? A better title might be “The Compassionate Father.” It’s a story that suddenly brings into sharp focus all those Old Testament references to a God of compassion and mercy. It’s a story that reveals God as father by revealing the feminine side of God; a story that challenges us to rise above stereotypes and inherited patterns of behaviour and look again at the roles we play and the transforming biblical vision of God. Heaven and earth cannot contain our God, nor is any metaphor, any image, adequate. Our God is a rock and a wind and a consuming fire; our God is just and compassionate and faithful. Our God comes to us in the water of baptism and the bread and wine of the altar. Our God is like a father whose compassion is like the compassion of a mother toward her child. A sermon preached by Christopher L. Webber at All Saints Church, San Francisco, on March 10, 2019. St Luke 4, verse 1. So let’s think about wilderness. Some three to four thousand years ago the Hebrews were a nomadic tribe wandering in the deserts in the middle east. All around them were people who were farmers: Egyptians, Babylonians, Canaanites who raised wheat and barley and melons and other good things to eat and because they depended on the sun and the rain and the rivers, the soil and the seasons, and because these were not always favorable these agricultural people prayed to the powers that they thought determined success or failure, abundance or hunger, and they made statues and images as a focus for their prayers. Well, that’s what Lent is about: it’s a reminder that we are by origin a wandering, desert people with a radically unconfined God, a God who is free and calls us to freedom. Lent summons us to remember who we are and respond to that challenge. For forty days every year we are challenged to follow Jesus back out into the wilderness of our nomadic ancestors where there is none of the security of plowed land and settlements and walls and well-traveled roads. The Prayer Book speaks of Lent as a time for “special acts of discipline and self-denial.” It asks us to find out whether we can get along without the images and the idols – the things, the possessions, that tie us down and somehow give us a feeling of security. Can we put them aside and learn to live with God alone? All the old traditional disciplines of Lent – giving up candy and movies and television – the images of Canaan and Babylon – are basically about that: how addicted are you to the local idols? how dependent are we on material things? What is it that takes the time we might have used for prayer or the energy that might have been used to help someone in need or to work to change a society that seems indifferent to the needs of others? It’s probably not something as simple as candy or computer games. It’s things that have become part of the very fabric of our lives and it will hurt to tear them out. The idols are where they are because we’ve learned to love them and depend on them and believe we need them. So Lent asks us to look again, to focus on this fundamental question: who is your God? One of the old mystics used to say, “This too is not God.” It’s a good line to remember. Look around at your life: “This too is not God.” I think some of the most divisive arguments in our public life, church and state, are about idols – not God. Do you remember back a while ago the annual Christmas fuss about Christmas in public places? Almost every year it seems some mayor or public official tries to find a new way of putting up a creche to see who will complain. And someone always does. But, you know, I used to live in New England and back in Puritan days it was illegal to celebrate Christmas at all because I think the Puritans knew that so much of the celebration was pagan in origin and a distraction from the worship of the God who is beyond all images. The Puritans knew that but now their descendants, calling themselves Christians, demand that they be allowed their images, their creches and Christmas trees, and the very name of Christmas has become an image, as if by saying “Merry Christmas” out loud and in public instead of “Happy Holidays” the God who cannot be named is somehow honored. We still want our images, things to hold onto; We’re still afraid of the desert. Lots of churches, you know, use purple vestments in Lent. This church, like the one I served for the twenty-two years before I retired, follows the old English custom in Lent which wasn’t purple but monk’s cloth or unbleached linen. You come into church on Ash Wednesday and the crosses and pictures were draped in simple sack cloth and it felt like spring cleaning. Here I think the custom is to do that in Holy Week; the visual distractions are covered and there’s a sense of simplicity and cleanness. The Russian Orthodox have a custom called pustina, which has to do with going into a bare cell, a room with four walls and no more, to spend a day or two days or more – with nothing to see, nothing to hold on to – “sensory deprivation,” I think might be the modern phrase, removal of distractions. And who needs some such practice more than 21st century Americans whose lives are so full and whose souls are so empty? Lent is a time to clean house, to be rid of idols and images and preconceived notions to go into the “desert” or “wilderness” for forty days. Years ago, when I was in Israel, we had a guide who took us down from Jerusalem to Jericho – down through the barren land where Jesus spent those forty days – and along the way he showed us a bright splash of green down the side of a steep cliff and he said it came from a break in a conduit pipe that takes water to an ancient monastery and he said it shows you that this is not truly desert but wilderness. There is a difference. Desert, true desert, he said, is where nothing can grow. Wilderness is where growth can take place if only it has water. When the spring rains come the wilderness bursts into bloom. When the aqueduct springs a leak, the barren land turns green. Think about that this Lent. Yes, go back out into the desert, get rid of the idols, but then ask yourself this: where I am, can anything grow? Am I in the desert or the wilderness? I looked very carefully at the street outside the church this morning. I thought with all the rain this last week we might see some green pushing up through the sidewalk and know that this may be wilderness but it’s not desert. I didn’t see anything. Maybe it’s desert. But maybe we just need more rain to soak down in and get life going. But what about your office or place of work. What would happen if you poured some water near your desk or work place and watched for a week or so. Is it desert or wilderness? Try it at home. Pour some water on the television set, maybe just a cup or so every day for a week. And watch: does anything grow there? Does any life emerge? But did it ever really enhance your life? It might do good things for you anyway if you water it well. I will guarantee that if you do that – water your television regularly – you will, of course, wind up with a short-circuited TV, but you will also have a better social life, your thinking will clarify, and you will lose weight. But seriously, this is what Lent is about: Lent is a time to ask where I am, whether I’m in a place of life or not: am I in the desert or the wilderness: which is it? For all the visual richness of our society, a lot of it is desert: dead as it can be and deadening to those who come there. But we are not like the wilderness plants; that have their roots down in a dry place and have to wait for rain to come. No, we can move; we can pick ourselves up and put ourselves in a place where life can emerge and develop – real life, the life of the spirit, life that can transcend even death itself. And we can carry that life with us and make things bloom where we are. I trust this church is such a place: a place that can flourish and grow with your prayers and your presence and your participation. I trust your home and place of work can be such a place. But it depends on what you bring to it from here, from the sacraments ministered here, from the Word of God read and proclaimed and taught right here. I believe that this city, the places you work in the places you live in are not desert but wilderness, needing what you can absorb here and take there and capable of real life. But it’s not automatic and it won’t happen unless you want it to happen and make time for it to happen. God twists very few arms. God wants us to respond in freedom. But God does want us to grow. God does want us to focus on life. God does want us to turn away from all that which is not God to come, to come, to come now while we have time, to come to the One who is. A sermon to be preached at the Church of the Incarnation, San Francisco, on Shrove Tuesday, March 5, 2019, by Christopher L. Webber. TEXT: Render to Caesar the things that are Caesar’s, and to God the things that are God’s. Shrove Tuesday is not in the Prayer Book. Shrove Tuesday is not really a religious occasion. Shrove Tuesday has about as much to do with my faith as Halloween. Exactly like Halloween, Shrove Tuesday grew up as a kind of a pagan blow-out before a serious Christian occasion. Watch on the television news what they do in New Orleans and in Rio, and tell me what that has to do with Christian faith. What both Halloween and Shrove Tuesday are is one last chance to be silly before we need to be serious. That may explain the assigned first reading from Tobit in the Apocrypha (see below). I guess some committee somewhere thought it might be edifying for today, but I can’t imagine why. I also have no idea what the Gospel reading has to do with either Shrove Tuesday or Lent – but it does tell us one thing we need to know at this moment in American history: God comes first. Always – in everything – God comes first. Jesus, I’m sure you know, was brought up on political charges and crucified as a danger to the state. And Christian faith is a danger to the State. It’s why for centuries the authorities tried to tame Christian faith by giving the church political power. The Archbishop of Canterbury has an interest in the state because he is appointed by the monarch and you don’t bite the hand that feeds you. Our founding fathers tried to do it the other way by separating church from state and leaving the church – which was established in New England and Virginia – without power or influence. Can you imagine sitting down to consider what part of your life and possessions belong to Caesar? If you were to make two piles and put in one pile everything that came to you from God, what would there be to put in the second? So start from there. All that we have – all life – is God’s gift. God is the Creator. All that I have is God’s gift. When stewardship time comes around and I set aside ten percent for the church, I’m not being generous. I’m returning to God a small part of what God has given me. It used to be common to say at the offertory, “All things come of thee, O Lord, and of thine own have we given thee.” It’s not in the current Prayer Book, but it’s still true. All that we have comes from God and stewardship comes first. Taxes come second. Caesar comes second. But since what we give to Caesar was God’s gift first to us, we need to be sure that whatever we give to Caesar is used for God’s purposes. We have a vote to use to do what we can to ensure that Caesar uses our taxes – which are God’s gift to us – for God’s purposes, not Satan’s. So my taxes pay for a military to keep us safe and perhaps to keep others safe, but never to conquer or oppress or do harm to others. My taxes can be used to provide assistance to those in need, but not for the benefit of the wealthy. My taxes can create schools and hospitals, roads and bridges, they can provide relief for communities devastated by fire and flood, and we can differ as to how much is needed for such purposes. We can differ also as to the value of a wall on the southern border, but the money to build a wall is God’s gift to us to be used for God’s purposes. God surely wants us to be safe, but God cares equally or more for women and children who are in fear of death and who turn to us for refuge. widow and orphan, those in need first of all. So the gospel for this day – this semi-sacred solemnity – is a good one for all occasions, but perhaps especially for Americans this year as we argue about border walls and health care for all and climate change. As a nation, we have been blessed beyond anything Caesar ever imagined, yet there is need visible every day on our television screen and we have the means to make a difference. God has given us the means to make a difference. And whatever it is we give to Caesar, we should remind Caesar where it comes from and to whom it belongs and that it must be used to make a difference for good and to the glory of God. A Reading from the Book of Tobit. The Holy Gospel according to St. Mark (12:13–17): Then they sent to him some Pharisees and some Herodians to trap him in what he said. 14 And they came and said to him, “Teacher, we know that you are sincere, and show deference to no one; for you do not regard people with partiality, but teach the way of God in accordance with truth. Is it lawful to pay taxes to the emperor, or not? 15 Should we pay them, or should we not?” But knowing their hypocrisy, he said to them, “Why are you putting me to the test? Bring me a denarius and let me see it.” 16 And they brought one. 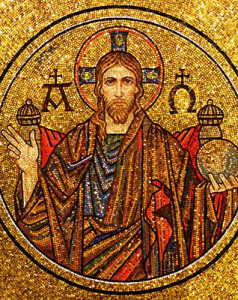 Then he said to them, “Whose head is this, and whose title?” They answered, “The emperor’s.” 17 Jesus said to them, “Give to the emperor the things that are the emperor’s, and to God the things that are God’s.” And they were utterly amazed at him.